What does it mean to love our neighbor when that neighbor is a co-worker (boss, peer, or subordinate), customer, vendor, or competitor? "Being nice" to others in the workplace is a good start, but applying the Golden Rule at work goes way beyond that. Do we treat others how we might want to be treated? Do we treat others with honesty and dignity? Do we offer thanksgiving and congratulations? Do we act ethically? As Jesus taught us in the story of the Good Samaritan, love of neighbor means going beyond the bare minimum responsibility we have and into a "self-giving love" that may even affect our "bottom line." Subtlely outing ourselves as Catholic in the workplace can be an opportunity for healing and/or evangelization: it often opens up conversations about the Church and faith. View the week 5 public page for more ideas. In the Gospel, Jesus tells us to love God and neighbor. 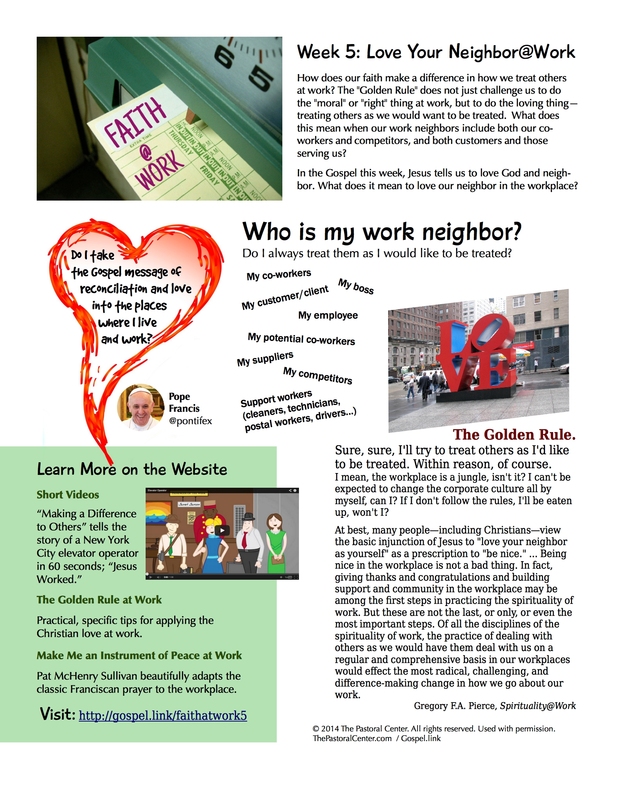 What does it mean to love our neighbor in the workplace? See the overview above for ways to develop this topic.